Old Town Trolley Tours is the best way to see the city. The tour is also designed so that you can hop on and off and explore on your own at any time. Our fleet of orange and green trolleys travel frequently throughout San Diego and over the iconic San Diego-Coronado Bridge to Coronado on a continuous 25-mile loop visiting 10 neighborhoods with 10 destination stops. Pandas, penguins and rare plant life are just a hint of what you’ll see when you visit the world-famous San Diego Zoo. Throughout its 100 acres, you’ll feel as if you’ve traveled around the world as you see some of the most intriguing and rarely-seen animals lounge in their natural, expansive habitats. Attraction tickets do not have to be used on the same day. E-tickets for Old Town Trolley Tours are sold exclusively through Trusted Tours & Attractions. Trusted Tours offers industry-leading value, guarantees, security and pricing for hundreds of the top tours and attractions throughout the United States. As you explore the scenic coastal landscape, you’ll learn why San Diego is called “America’s Finest City.” Since 1989, Old Town Trolley Tours has provided sightseeing tours highlighting the best of San Diego. With more than 4,000 animals representing 800 species, the San Diego Zoo stands out among other zoos for its diverse wildlife citizens. 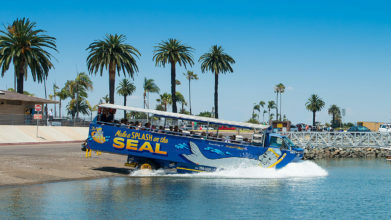 As you explore the scenic coastal landscape, you’ll learn why San Diego is called “America’s Finest City.” Since 1989, Old Town Trolley Tours has provided sightseeing tours highlighting the best of San Diego. Hop aboard one of our trolleys and you’ll experience Transportainment, a delightful combination of transportation and entertainment. Our friendly conductors narrate the San Diego tour with a fascinating and fun mix of trivia and humorous stories. It will be our pleasure to guide you through the birthplace of California on one of our orange and green trolleys. Old Town Trolley Tours is the best way to see the city. Because we showcase the best of San Diego and Coronado, you can avoid costly parking and city driving. The tour is also designed so that you can hop on and off and explore on your own at any time. With frequent pickups at all our stops, this helps you avoid walking long distances. Pandas, penguins and rare plant life are just a hint of what you’ll see when you visit the world-famous San Diego Zoo. Throughout its 100 acres, you’ll feel as if you’ve traveled around the world as you see some of the most intriguing and rarely-seen animals lounge in their natural, expansive habitats. With more than 4,000 animals representing 800 species, the San Diego Zoo stands out among other zoos for its diverse wildlife citizens. See hippos swimming alongside buffalos and koalas climbing in Eucalyptus trees. And that’s just the beginning. Lush, tropical pathways are thriving with botanical species that are both beautiful and exotic. Over 6,500 different types of plant-life are a spectacle not to be missed. **OFFER VALID ONLY ON THE DAY OF YOUR TROLLEY TOUR. Some museums offer free admission. Others are free due to the partnership with Old Town Trolley Tours. Your tour ticket is proof of purchase for admission to these museums. Hop on and off at any of our 10 convenient stops. Stop A - Old Town 4010 Twiggs St.
Stop C - Seaport Village 480 Kettner Blvd. Stop F - Gaslamp Quarter 4th and Island Ave.
Memorial Weekend – May 25-27, Rock-N-Roll Marathon – June 1-2, Independence Day – July 4, Comic Con – July 18-21, AFC Half Marathon – August 18, Labor Day Weekend – August 31 – September 2, December Nights – December 6-7. Open every day of the year, including all holidays. Call 619-231-1515 for specific times.